Book suggested for rating by Paul's Here. I've never read anything by Ann Coulter before; I've seen her many times on TV. While an excellent critic of liberals, her religious views have always been a put off for any further analysis of her. But the title of this book sounded interesting, so I took a chance on reading it (actually listening to it through the audio book on my Kindle) to learn something about her and her ideas. In this book, she provides an interesting historical theory of how liberals and the Democratic Party became the representatives of pressure group warfare, or as she puts it, "the mob." Tracing the current political justification for mob action back to the French Revolution and the ideas of Rousseau and Robespierre, she provides example after example of how mobs depend upon emotional and irrational organization. Using Le Bon's theory of crowd or mob mentality, she demonstrates how the mob evolved through various permutations in Western society. The Democratic Party has been the home to the mob throughout US history. While mob activity was severely restricted throughout US history due to its conservative ideas and the Constitution, violent mob activity, from the KKK to slavery, from union violence to segregation, has always been located in the home of the Democratic Party. But mob action in the US had always been regarded as dangerous and socially wrong until the civil rights movement of the 60's. Here, mob action had taken over a good cause and changed American's views about mob action: it became acceptable for a good cause. And this leads to an interesting thesis of Coulter's: an explanation of why the South "switched" from being a Democratic Party stronghold to a Republican Party supporter. The Democrats had always been the home of the segregationist mob but with the increasing voting block of the southern blacks (due to laws that eliminated racial restrictions on voting enforced by Republican administrations of Eisenhower and Nixon), the Democratic Party found a new mob: the violent activity of some of the civil rights leaders, starting with Martin Luther King. Realizing that they needed the blacks to continue to win elections, the Democrats quickly and easily switched from being segregationists to civil rights supporters, thus creating the false idea that the Republicans were now the supporters of Southern segregationists as the South swung toward the Republicans. The Democrats then came up with false theory of a Republican "southern strategy" used by Nixon. In fact, it was Eisenhower and Nixon and Thurgood Marshall who were using legal means to break down barriers for the individual rights of blacks. The Democrats used every opportunity to stall and slow down such laws. When Johnson tried to pass the 1964 Civil Rights Act, so many Democrats opposed it he had to get many Republicans to support it to get it passed. The Democrats then took over the mob and used laws not only to ban segregation in government entities but they began to ban private action. When the Republicans opposed this, the Democrats sealed the deal and painted the Republicans as segregationists and racists. While Coulter does a very good job developing her theory of the mob and how the Democratic Party is its home, she unfortunately supports religious justifications for her support of the Republicans and conservative ideas. Here, she does less than an adequate job of formulating and integrating her ideas. While she asserts that many Founders were religious conservative, except for Jefferson and Franklin who were the least religious, she does not demonstrate any causal connection between such religiosity and the ideas implemented by the Founders through the Constitution. She simply asserts that many people asserted that these ideas were based upon their religious beliefs, that the Declaration of Independence refers to god several times, etc. Amazingly, she asserts that the Anglican form of Christianity is the best religion in the world because it produced the United States. Fortunately, such references are few and far between in the book. 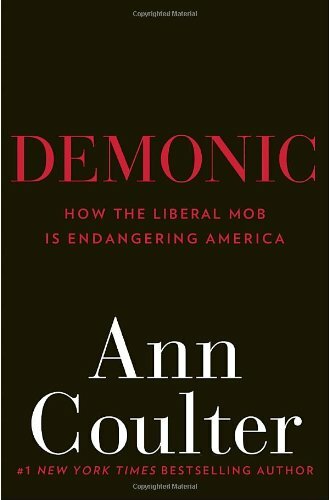 She does not offer a full justification of religion in this book, so one can safely ignore those elements and appreciate the numerous examples and historical references that support and explain her thesis that "the Liberal mob is endangering America." Indeed it is!! Excellent review - thank you. I looked at one of her earlier books and it was nothing but sophomoric snide one-liners in a boiler-plate format, similar to the way she talks with very little informative content. I also heard what was supposed to be an interview with an Objectivist in which she went into her normal snide attack mode, repeatedly misrepresenting Ayn Rand's ideas and refusing to listen to what was being said to her. She is not someone to trust with an idea. While she asserts that many Founders were religious conservative, except for Jefferson and Franklin who were the least religious, she does not demonstrate any causal connection between such religiosity and the ideas implemented by the Founders through the Constitution. She simply asserts that many people asserted that these ideas were based upon their religious beliefs, that the Declaration of Independence refers to god several times, etc. Amazingly, she asserts that the Anglican form of Christianity is the best religion in the world because it produced the United States. The Church of England? Weren't they on the other side of the Revolution? They "produced" the United States all right, by provoking it. She does not offer a full justification of religion in this book, so one can safely ignore those elements and appreciate the numerous examples and historical references that support and explain her thesis that "the Liberal mob is endangering America." Indeed it is!! The typical approach of religious conservatives is to string together God quotes from the Founders and claim that it means America was based on religion. They ignore their discussions of what they said they were doing in reference to Enlightenment writers such as John Locke and ignore the disparity in content between American individualism and Christian other-worldliness as the philosophy of the Dark Ages. The clash is hard to miss if you're paying attention to what the words mean, but they do it repeatedly. Yes, but this was not the focus of the book, and fortunately was not a significant part of the book. Her historical analysis of liberalism is quite interesting, with numerous historical examples. She does attribute the liberal agenda in part to an atheistic thread, such as the supporters of the French Revolution. But she does not demonstrate an understanding of reason, in the Objectivist sense, at all. It is true that the major massacres that have occurred since the French Revolution rejected religion and morality. Like the 20th century Nazis and communists where hundreds of millions of citizens were killed by their own leaders all over the world, over 600,000 French citizens were killed by their own leaders. Whereas in the American Revolution, about 10,000 people were killed during the revolution and its leaders did not turn on its citizens in the name of French society and revolution. One of the points that Coulter makes is that the AR was completely different from the FR in 1793. Most Americans are taught that there are similarities, and that the FR is something to admire. But the FR was simply the first of many social events where the mob took over, with bloodletting and destruction resulting. While it is true that the Anglican Church did contribute to anti-British sentiment, most Founding Fathers considered themselves British citizens right up to the time of the Revolution. The leading American politicians were doing everything they could to get the monarchy to treat them justly. The Americans did not seek to destroy the monarchy, as the French did. There was no widespread slaughtering of Tories in America. The Americans simply wanted separation from England, not destruction of England. Whereas in the American Revolution, about 10,000 people were killed during the revolution and its leaders did not turn on its citizens in the name of French society and revolution. Should be: "and its leaders did not turn on its citizens in the name of American society and revolution."